For over six years, two children in coastal southeastern China were cared for exclusively by their senile 76-year-old grandmother, leaving them mute and developmentally challenged. Brother and sister Yi and Qin lived in the village of Dapu in Fujian Province. They are among China’s millions of “left-behind” children, whose parents leave them for much or all of the year in order to find work. 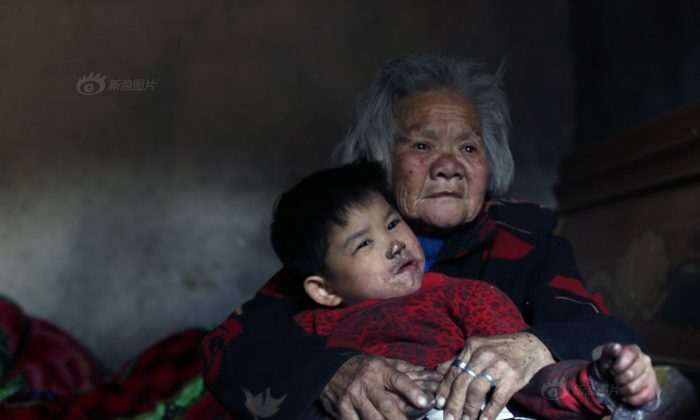 China’s Tencent News reported in April that the children were often put on leashes and confined indoors by their grandmother. The brother, Yi, is now 11 years old. Though he can understand others, he cannot speak clearly and has a slight learning disability. His sister Qin is more seriously affected by their years of isolation. A concerned neighbored surnamed Lin told Tencent that she had originally wanted to send both children to a school of special education in the county of Yongchun, but Qin was too handicapped to attend. She is still in the care of her grandmother. Qin is locked up in the house and tethered to the window with a cord whenever her grandmother leaves the house. Sometimes this lasts for several hours. Fellow villagers send the destitute family vegetables. Fellow villagers arranged for Yi to receive special education and pay rent for him to live in a simple home near the school. The home where Yi and Qin lived. Qin under the watch of her grandmother as she picks vegetables. Locals have started a donation campaign to collect funds for the family so that Qin need not be restrained. Qin impulsively grabs some leftover noodles while her grandmother makes lunch. Qin’s feet are dirty and blistered since she has few opportunities to wear shoes. She runs around impulsively and stuffs things in her mouth. Sometimes Qin escapes the cord that keeps her near the window, and runs outside. The grandmother has difficulty finding her and must rely on village neighbors to help.